“Any attack on a medical facility in a war zone is an affront to humanity, yet this bombing is sadly just the latest in a grim series of attacks on hospitals and clinics by the Saudi Arabia-led coalition,”Philip Luther, Research and Advocacy Director for the Middle East and North Africa at Amnesty International, said in the official press release. In five of the last 18 months of the Saudi-led war in Yemen, the coalition hit more non-military than military targets, a Guardian study has revealed. Overall more than one-third of all strikes ended up hitting civilian sites including hospitals, schools and mosques. After analyzing public source data for some 8,600 air raids conducted by the Saudi-led coalition between March 2015 and August this year, the Yemen Data Project concluded that only 3,577 sites were of a military nature. Some 3,158 were listed as non-military, while 1,882 strikes were classified as unknown, the Guardian said in its analysis of the data. Furthermore, the data which has been collected from open sources and cross-referenced by the NGO using a wide range of information showed that Saudis flew 942 air raids on residential areas. The planes managed to strike 114 markets, 34 mosques, and 147 school buildings, in addition to 26 universities. The information also revealed that Riyadh targeted transportation network, striking some 37 transport sites. The Yemen Data Project said that the coalition hit more non-military sites than military in five of the last 18 months, with some target areas being struck on multiple occasions. One particular school was hit nine times, a deplorable fate that is shared by one market that was hit at least 24 times. He blamed the Houthi fighters of turning civilian buildings such as schools and hospitals into “command and control centers” and“weapons depots” that no longer made the sites civilian targets. “They are military targets. They might have been a school a year ago. But they were not a school when they were bombed,” he said. “It’s sickening to think of British-built weapons being used against civilians and the government has an absolute responsibility to do everything in its power to stop that from happening,” the UK’s shadow defense secretary, Clive Lewis, told the Guardian. Lawmakers in the US are also calling to ban arms sales to Riyadh after Saudi-led bombing campaign continues to receive worldwide condemnation for its conduct from human rights groups and the UN. “Selling $1.15 billion (£870 million) in tanks, guns, ammunition, and more to a country with a poor human rights record embroiled in a bitter war is a recipe for disaster and an escalation of an ongoing arms race in the region,” Republicans Rand Paul said earlier this week. Last month 64 members of the House of Representatives signed a letter urging President Barack Obama to delay the sale after the State Department approved the potential delivery of more than 130 Abrams battle tanks, 20 armored recovery vehicles and other equipment to Saudis. “This proposed sale will contribute to the foreign policy and national security of the United States by helping to improve the security of a strategic regional partner which has been and continues to be a leading contributor to political stability and economic progress in the Middle East,” Security Cooperation Agency said in the press release. 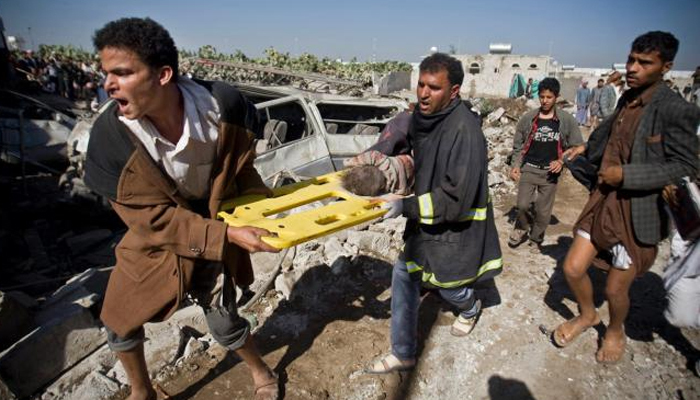 Saudi Arabia sent troops to Yemen to restore ousted Sunni president Abd-Rabbu Mansour Hadi to power in March 2015. The intervention claimed the lives of at least 10,000 people, including almost 4,000 civilians, according to conservative UN estimates. The majority of victims were killed in airstrikes. Peace talks mediated by the UN which aimed to bring hostilities to an end faltered last month and fighting continued.